Beef, soy sauce, sugar, artificial flavor, lemon and lime juice, garlic, hot sauce, cayenne pepper, chili pepper, pepper, garlic powder, chili powder, cinnamon, chipotle. The first flavor that hits my palate is a light smoke followed by a light soy sauce and a trace of sweet. There's a faint garlic and chipotle that trickles in. The chewing brings on some of the natural meat flavors, while hints of cinnamon can be identified. For being labeled as "Sweet & Smokey", both are light but still noticeable. The sweet doesn't really strike you, it instead takes a back seat yet continues to help color the overall flavor. The smoke is perhaps the first noticeable flavor, but eventually allows the other ingredients to come through. Together, there's enough of the duo to deliver this jerky's marketed flavor. Otherwise, the primary taste profile is soy sauce but boosted with a light cinnamon and smokey chipotle, a touch of sweet, traces of seasonings, all over a light natural meat flavor. Despite the use of hot sauce, cayenne, and chili pepper, there's zero heat to this. 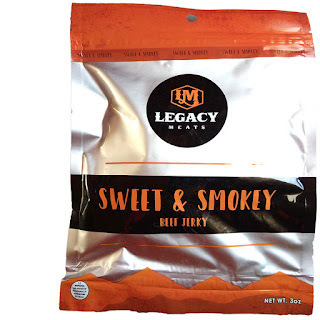 This Sweet & Smokey beef jerky from Legacy Meats has a pleasant chipotle smokiness over a light sweet, yet remains mild in spice. 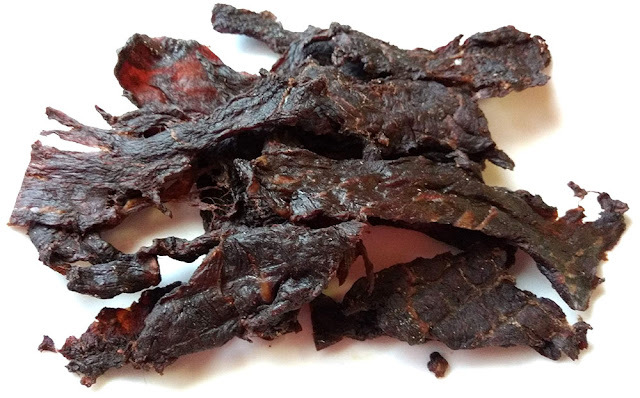 It's largely a soy sauce-forward chew but boosted with a touch of cinnamon and smoked pepper over a light natural meat flavor. It even has a subtle chewing-tobacco flavor, perhaps suitable for dudes trying to wean off the dip. There's still a lingering natural meat flavor that helps keep this meaty and beefy in profile. The chewing is great; chewy yet tender, dry yet soft, with a genuine steak-like texture. 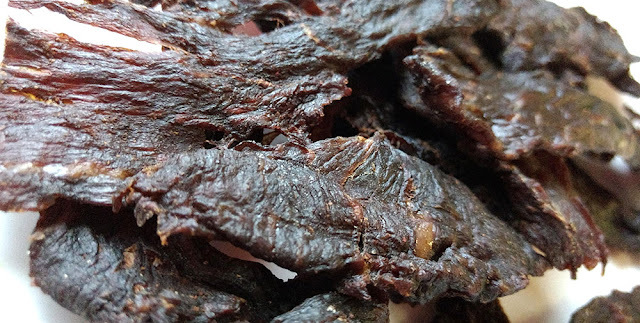 While I did find these slices salty, and beckoning a cold refreshing drink, it's very much a cowboy-style jerky for its strong flavor and a meaty representation of the Colorado Front Range.